Amazon is shutting down its local daily deals site and mobile app next month, another ominous sign for a business that was once considered hot. 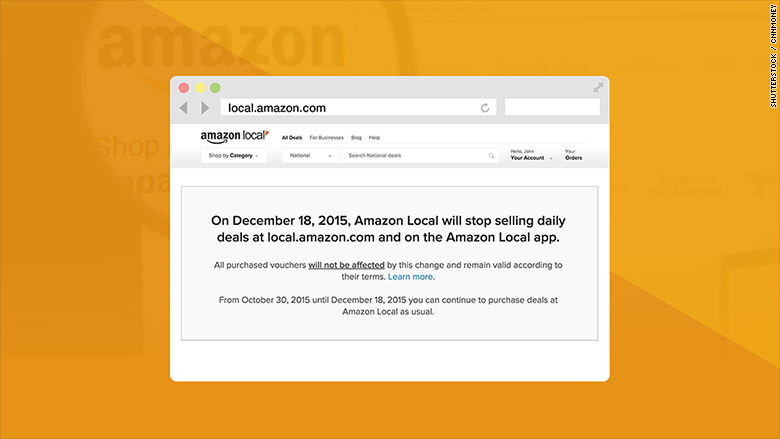 According to the website for Amazon Local, customers can continue to make purchases between now and December 18. Amazon (AMZN) said that all vouchers already bought will continue to remain valid. The demise of Amazon Local comes just weeks after another daily deals site, LivingSocial, announced that it was laying off about 200 people, 20% of its staff. Amazon was once an investor in LivingSocial. But Amazon took a $169 million writedown on its LivingSocial stake three years ago. And the other company synonymous with daily deals, Groupon (GRPN), is in trouble too. It announced in September that it was cutting 1,100 jobs -- mostly from its international operations. The stock has lost more than half its value so far this year. Groupon is now worth just $2.4 billion -- a far cry from the $6 billion that Google (GOOGL) offered to buy it for a few years ago. Groupon will report its latest quarterly results after the closing bell Tuesday. Analysts are predicting that both sales and profits will be down from last year's third quarter. This should be a cautionary tale for techs, particularly privately-held unicorns, about how rapidly the tastes of consumers and investors change. As Heidi Klum says on "Project Runway, "-- "One day you're in and the next day you're out!" Local daily deals were once thought to be the holy grail for Web commerce. When Amazon invested in LivingSocial in 2010, LivingSocial's valuation was estimated at $1 billion. That made it a unicorn -- years before the phrase become the popular way to refer to ten-figure startups. Groupon started being used as a verb, just like Google. CBS (CBS) even ordered a pilot for a sitcom about Millennials working at the real Groupon in 2012. With Christopher Mintz-Plasse (McLovin from "Superbad") starring no less! The show -- curiously titled "Friend Me" (remember, it was about Groupon, not Facebook (FB)) -- never aired though. If it did, the show quickly would have turned into a sad melodrama. Amazon was not immediately available for comment about why it was shutting down Local, which it launched a little more than four years ago. But in an FAQ section on its site, Amazon said it was not exiting the local commerce business entirely. 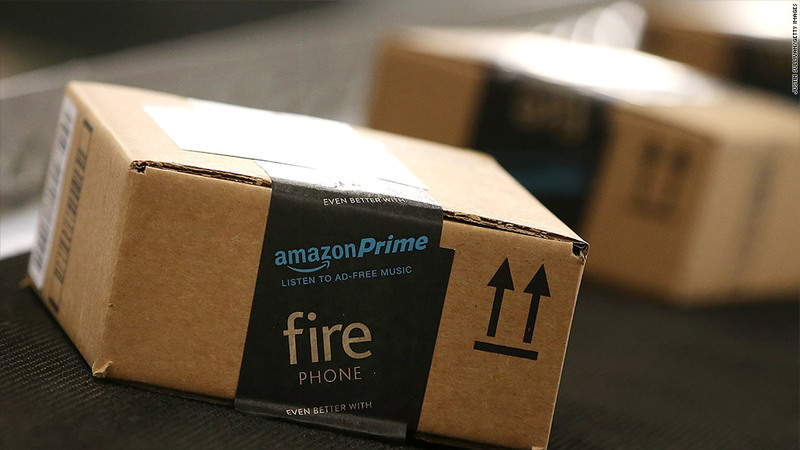 "Amazon still helps connect customers to local businesses through a variety of offerings - including Amazon Home Services and Prime Now Restaurants," the company said. Groupon and its rivals are hurting because local merchants now have many other ways to effectively market themselves beyond huge discounts on daily deals sites. Facebook is one. Yelp (YELP) is another. That's why Groupon has started to shift its focus away from those daily e-mails to other areas of e-commerce, such as travel as well as its Amazon and eBay (EBAY) competitors Groupon Goods and Groupon Stores. Arvind Bhatia, an analyst with Sterne Agee CRT, thinks there is still some hope for Groupon. "They have to transform their business even faster than they have been able to so far. They have to show that there is growth," he said. At a bare minimum, the upcoming closure of Amazon Local and LivingSocial's continued woes could give Groupon an opportunity to regain ground in daily deals. "They don't have as much competition anymore," Bhatia said. True. But the market went from being like the chocolate or vanilla of tech to rum raisin or butter brickle. Sure, somebody still likes them. That's still not saying much though. So take note, unicorns. It will be interesting to see if the sharing economy and messaging apps turn out to be as passe as daily deals by the time 2020 rolls around.